The Indian subcontinent (present-day India, Pakistan, Bangladesh and Sri Lanka - henceforth referred to, for convenience, as ‘India’) contributed the largest volunteer army in history to the Allied cause during the Second World War. Out of a population of some 384 million, over 2.5 million servicemen and women, every one of them a participant by his or her own choice, gave their services. Most of this mighty number served in the Indian Army - 700,000 of them in the 14th Army in Burma, representing nearly three-quarters of its strength. Indians served in the North African campaign against the Germans, in Eritrea and Abyssinia against the Italians; in the Middle East, Iran and Iraq; in the Far East; in Italy, where they took part in some of the bloodiest fighting at the siege of Monte Cassino and elsewhere. Many Indians took to the seas - 30,000 joined the Royal Indian Navy, and many thousands served as merchant seamen. The air service attracted a large number of Indians. 55,000 joined the Royal Indian Air Force as flyers or ground staff, while several enterprising airmen came to Britain to serve with the RAF. Indian women took part in their hundreds of thousands, either as WRINS (Women’s Royal Indian Naval Service) or WACS (Women’s Auxiliary Corps: Indian), or as nurses, munitions workers and many other forms of service. In addition, it is estimated that some 14 million Indians took part in other forms of war work. The price paid by the Indian subcontinent for its service was heavy. 36,092 volunteers were killed or reported missing. 64,354 were wounded, and almost 80,000 had to endure captivity as prisoners of war. No fewer than 30 Victoria Crosses – the highest award for bravery and devotion to duty – were awarded to members of the Indian Army. Around 112,000 Gurkhas from Nepal fought with Allied troops during the Second World War, winning ten Victoria Crosses of which 19 were won by Indians. 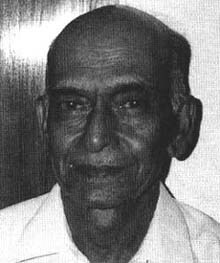 Mahinder Pujji was born in Simla, India in 1918. He went to school and college in Lahore and went on to study law. In 1936 he learned to fly at the Delhi Flying School, where he fell in love with flying. When war broke out he saw a newspaper advertisement asking for pilots to join the RAF. Pujji thought this would be a great adventure. He volunteered straight away and came to England. 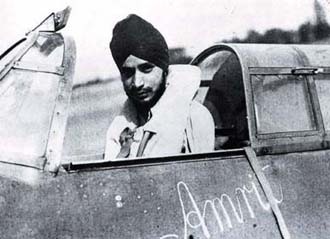 He was one of the first Indian pilots to serve with the RAF, flying Hurricane fighter planes in 1940-1. "On one occasion I suddenly found that my dashboard was gone - I didn’t notice because of the noise of the engine. A bullet had passed through my jacket and the whole of the dashboard was shattered. Then black smoke and oil started coming from the front of the engine at about 18,000 feet. I started to glide over the English Channel. At 7,000 feet I was advised by radio to bale out of the plane over the Channel where I would be picked up by a boat in the area. But as I could not swim and did not like the idea of jumping out of the plane I told base that I would try to make a forced landing. I was encouraged when I saw the white cliffs of Dover, and everything was going fine until I opened up my landing gear and the plane burst into flames. I managed to crash-land the plane and was dragged from the burning wreckage. I spent the next seven or eight days in hospital." "The day I shot down my first aeroplane, I went into my room and lay down – I didn’t want to talk to anyone. What I had gone through - that could have been my death, you see." "When I was in England during the war I was treated very well indeed. I had my own driver and petrol was paid for. When I went to the cinema I used to get in the queue with everyone else, but people would insist that I got to the front of the queue - I think it must have been my uniform. I would get to the front of the queue and try to pay for my ticket, but was let in free. Similar things happened at restaurants in the village; often the owners would not take payment for a meal. I felt very welcome indeed, I never felt different or an outsider and my experiences in this country made me keen to return some time after the war. I was made to feel very much at home by everyone I met." Nila Kantan was brought up in Andra Pradesh, and volunteered for the Indian Army in 1940 at the age of nineteen. He saw service with transport and supply units on a wide range of fronts - Eritrea, Syria, North Africa (including the crucial Battle of El Alamein in 1942), Italy (where he served at the siege of the town and monastery of Monte Cassino) and the Far East. 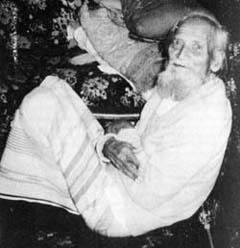 Monohor Ali was born in Mullargaon, Sylhet in 1895. In 1915, during the First World War, he went to Britain and served on British ships. When the Second World War began, Monohor Ali worked on cargo ships and troop carriers as a donginwallah, or charge-hand in the engine room. "You needed courage to work on a ship in wartime. If you are a nervous person it is better to stay away from the sea. Although I was an engine room worker, I still often had to go behind the gun to watch the enemy." "Me and my nephew were working on a ship called the SS Ash Crest. The ship sailed through the Straits of Gibraltar to the Mediterranean with coal. It docked at a port in the South of France. When half of the cargo was already unloaded, we heard that the Germans were advancing towards the port, so we stopped unloading. We saw hundreds of people coming towards the port – men, women and children. Some people wore uniforms and all were hoping to get away." "The people were getting into every vessel in the port, until the vessels were packed up - then they were rushing out. Our SS Ash Crest alone had 720 grown-up people; the children were not counted. There was not any empty space. People were sitting everywhere, squashed and hardly able to move, but very well-behaved and co-operative. There were rumours that the SS Ash Crest had been lost. The Germans did attempt to attack us from a submarine but our gunner sank the submarine. So we escaped and were very careful on our way back. It took us seven days to reach Liverpool." Tilbahadur Thapa (on the left) fought with the Gurkhas in the British Indian Army in Burma. In 1943 he volunteered for service with the Chindits, a group of soldiers operating deep in the jungle behind enemy lines in situations of great difficulty and danger. "One night we camped and started to cook our meal. As we were cooking, the Japanese attacked us on all sides and a free-for-all developed man to man, kukris, bayonets, swords, hand-to-hand. Both sides fired blindly, even killing each other, Gurkhas killing Gurkhas and Japanese killing Japanese by mistake in the confusion. It was like a nightmare. So noisy was it that we could not hear each other clearly. The jungle was set alight. Pandemonium all round. We were all shouting, 'gun-nu-nu-gun-nu-nu-gun-nu-nu!’"
"The next day we took stock of the situation and by evening we were organised enough to move off into the night. We walked till dawn when we stopped in some low-lying ground. We opened our wireless and were told to return to India. We went back the same way and, on reaching the Irrawaddy, started making boats and rafts from cane and bamboo." The Gurkhas were ordered to split up into small groups and make their own way back to British lines. "We were ordered to bury all heavy weapons and only take light automatics and rifles. We were to let all our animals go free. I found myself in a group of six, all muleteers who knew nothing. I made all the decisions. I had a compass. We found wood-apples and ate them. There was nothing else. Later we killed and ate deer. We tried nettles but it made us piss many times during the night." "We moved like that for three months, living off the land. We were afraid of elephants, bears and apes. Sometimes we slept in trees and sometimes on the ground, where possible in caves." "By now it was the rainy season and we eked out our matches and salt. We had some money so we decided to go to a village, buy some rations and if possible rejoin our troops. I said 'If we meet up with our forces, we'll get home: if we meet the enemy, let us die.’ We had no hope of survival..."
Tilbahadur and the others went into a village in search of food, but they were tricked and handed over to the Japanese. "We were taken into the jungle and stripped. We were fed with the remains of some burnt rice, scraped from the bottom of the cooking pot. Then on to a prison where there were about twenty Gurkhas." "Next morning the Japanese took us outside. They were dressed in smart uniforms. The jail commander turned to us and said, 'Look how smart our men are. You are useless mouths.'" "We were then marched off, walking day and night, to Rangoon jail. There were seven hundred people of all kinds bound arm-to-arm, lying on their backs, unable to stretch their legs. A trench under them took their urine and faeces. We were also trussed up like that." "The smell was dreadful: mosquitoes went 'gu-nu-nu-nu-nu-nu' all night and flies buzzed all day. And so hot! We were let loose after one month and taken out. We were lectured by a Japanese officer who asked us if we were willing to work for them or go back to jail. 'Those who want to work put up your hands.' Every hand went up..."
The Japanese moved the prisoners up-country to Mandalay. There they came under air attack from British fighters. Tilbahadur and another Gurkha took advantage of the chaos to escape and were soon joined by two more. It took them seven days – without food of any kind, only water - to reach the British lines.